2.1. 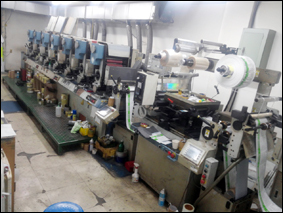 7color Front Printing unit with 7 U.V Dryers. 2.2. Easy to precise registration adjustment with unique slide print system and Japan DD Servo motor/Drive feed unit system of unwind/rewind both side. 2.5. Print Cylinder: 2sets x 14pcs. 2.6. Print unit has the "left/right transfer adjustment system" for efficient to registration. 3.3. Strong flat-bed die-cut pressure by applying the inertial fly-wheel system with digital setting control by Japan DD servo motor feed unit. 3.5. Mark Sensor Scanner for 2nd pass job. 5. 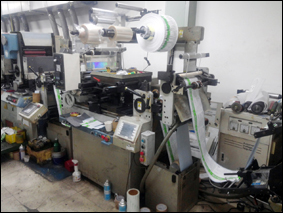 Hot-LAMINATION Unit 1 & 1 Cold Lamination with Unwinder & Rewinder. 6.5. Jog, Start, Stop, Emergency Stop button, Mark button, Volume speed controller with LCD touch controller. 7. U.V. DRYER SYSTEM(AIR COOL) WITH TOUCH SCREEN CONTROLLER. 7.1. 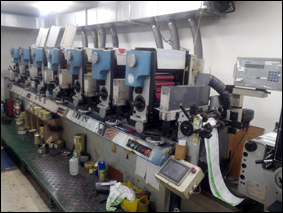 3 kw at 1st, 2nd, 3rd, 4th, 5th, 6th, 7th Front Print units (7 units). 8. Included the 1 Sheet Cutter & Rewinder & 1 Rotary exposure m/c.